Mahan glared at the rag tag army from the desert with contempt. If the Muslims weren’t standing in formation he would have confused them for a mob. They had no uniform. Their weapons were anything but standard; one had Sasanian sword, another a Roman shield and the next a bow taken from a dead Ghassanid archer. Now these fakirs stood before him ready to do battle! Sitting on his horse behind his soldiers, Mahan could see the silhouette of the Muslim line as the sun rose up from behind. What do these backward desert dwellers know about strategy and war? And yet, thought the Roman General, these same Muslims had decisively defeated his comrades at Ajnadin, Damascus & Baisan. And they now occupied the one point of elevation on the scrubby plain of Yarmuk, which gave them an annoyingly good vantage. Mahan’s barrel chest swelled with confidence as he gazed at his soldiers standing in perfect formation with the standard of each squad and corps fluttering in the air. He had 120 000 of the toughest soldiers and most talented Generals produced by the Empire. Mahan knew he outnumbered the Muslim army 2 to 1 possibly 3 to 1. They had at most 40 000 troops. Their General was Khalid bin Waleed. 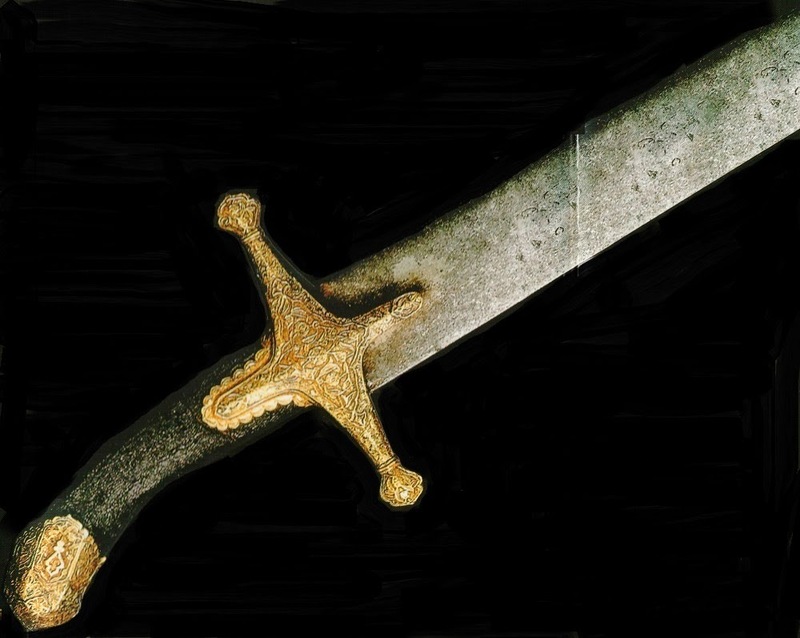 His people call him the "Sword of Allah". Ever since he entered the Syrian theater Mahan heard the stories. He was a man built for war, a military genius with a sharp strategic mind, a brilliant tactician and the strength to go up against any champion. Khalid (RA) employed strategies and battle field tactics that embarrassed the imperial armies of Persia and Rome. The destruction of the Persian army at Walaja was still talked about in the capital. Khalid (RA) enveloped the entire Persian army and annihilated it. Mahan, a student of military history, understood the significance of that victory. Many factors are required to pull off a double envelopment or pincer movement. As a result there are few recorded instances of this tactic being employed successfully. The Carthaginian General Hannibal first employed this tactic against the Romans at the Battle of Cannae in 216 BCE. But Khalid (RA) was not aware of Hannibal and must have developed his strategy independently. Mahan would not underestimate him. Mahan had the glory of Rome behind him. He’d studied his compatriot’s defeats and this time it would be different. He would go on the offensive and teach these camel herders a lesson in war. Along the entire front a third of his army charged shrieking across no man’s land slamming into the Muslim lines. Not a concerted effort; but simply to test the resolve of the battle hardened Muslim army. At the end of the day, both sides held the same position. As the sun set across the Yarmuk River, Mahan vowed the next day would be different. He would teach Khalid (RA) and the Muslims a lesson in war. Pebbles bounced up and down on the scrubby Yarmuk plain as the Roman soldiers thundered across the field. Mahan launched his left and right flank early in the morning hoping to catch the Muslims off guard. He planned to send wave after wave of fresh fighters until the Muslim line broke. He outnumbered Khalid’s (RA) army by a wide margin and knew that Khalid (RA) could not replace his tired troops. He would use his numerical superiority to his advantage. Squeezed between the treacherous cliffs of the River Yarmuk and the army of Abu Ubaidah (RA), Yazeed repulsed the initial Roman attack. How long could he hold out before fatigue kicked in, thought Mahan. The blowing sound of a horn filled the air. From his periphery he saw the second wave launch in unison screaming across the field as the Muslim line reorganized in expectation. The Romans crashed into the tired Muslims and engaged. There was vicious close quarter combat with broken bodies littered everywhere. Mahan could see his troops slowly gaining. Their standard fluttered in the air, it was never pushed back; just kept inching forward. Mahan’s eye zoomed in on that one standard, watching it in expectation until the Muslim line broke and the flood gates opened. On the left flank with the Azra hills off in the distance things were moving slowly. Amr Al Aas was putting up stiff resistance. 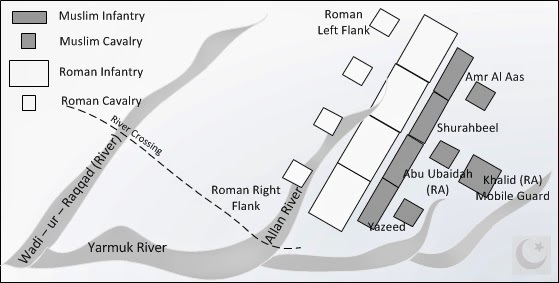 His troops repelled 2 waves of Roman fighters and the 3rd wave was barreling towards them midway between the two armies. It was just a matter of time thought Mahan. Even the most battle hardened soldier must give in to fatigue. At that moment the veteran general’s prediction came true; the Muslim line broke. Mahan relaxed. His clenched fists loosened. So far so good. The Muslims retreated in some disorder back toward their camp but there was no reprieve there. The women came out and threw pebbles at their men for retreating and exhorting them to turn and fight. The Muslim commanders reorganized their troops and launched a counter attack but they desperately needed support. Mahan sat smug on his horse and surveyed his work. He’d broken through on both flanks. From his vantage point behind the center army Mahan could see that Khalid (RA) had not deployed his mobile guard. Mahan knew why and his lips curled into a vicious smile. 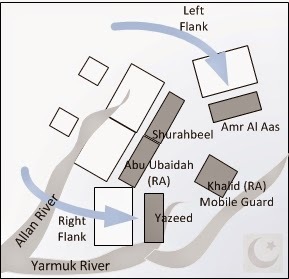 If Khalid (RA) supported one flank, the other flank would be overwhelmed. Checkmate. Mahan could taste victory. He was almost disappointed the famous Khalid bin Waleed (RA) did not provide a better challenge. So much for his reputation as a cunning strategist, thought Mahan. As if on cue, Khalid (RA) deployed his mobile guard. He unleashed his cavalry in support of Amr just as he was launching his counter attack. Mahan’s left flank was struck from two sides. Mahan watched in dismay as the Romans fought heroically but were beaten back to their original lines. No worries, this battle would be decided on the other side of the field. 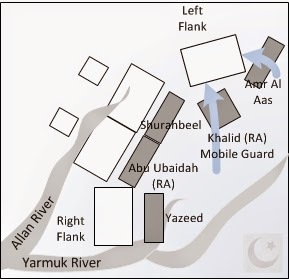 Once Mahan saw that Khalid (RA) had committed his mobile guard to the left flank, he scrutinized the tactical situation on the right and devised his next move with the Corps Commander of the right flank Gregory. Before Mahan had a chance to issue even a single order, a plume of dust rose up behind the Muslim lines at incredible speed. Mahan stared. 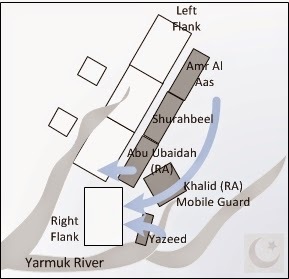 Khalid’s (RA) mobile guard raced to support Yazeed on the other side. The Muslim leader hit them from three sides, with Yazeed counter attacking, Khalid’s (RA) mobile guard charging in and Abu Ubaidah (RA) supporting. Mahan’s soldiers put up a stiff resistance but at the end of the day, they fell back to their original position. Mahan tipped his hat. Khalid’s (RA) reputation remained intact. The next day would be different. He’d learned a lesson from Khalid (RA). Excellent account of an important engagement in the history of Syria... I was "there" with them...Your battle maps are excellent!